Since I started my Pondering Playtime series at the start of the year, I’ve been really enjoying doing the different activities with my toddler. 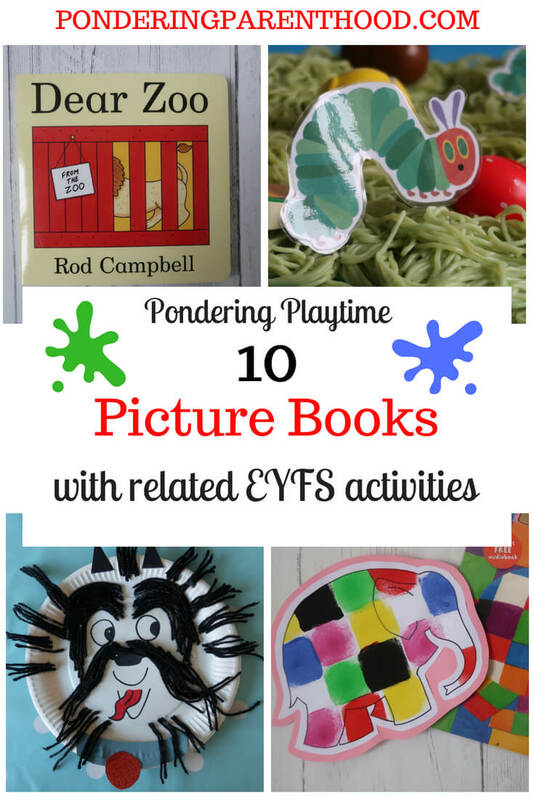 We love sharing books and M has been excited to recognise her favourite characters in some of the activities (she still talks about our Hairy Maclary paper plates!). As we’re now more than half way through the year, I thought I’d do a little round-up of the various EYFS play and learning activities that I’ve created. These are great for doing at home with your toddler, and some of them would work really well in an Early Years setting, too. 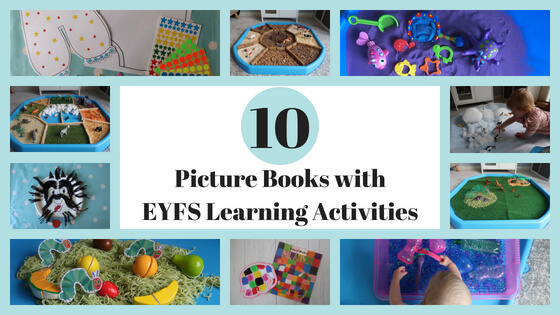 So, here are ten picture books and related EYFS play and learning activity ideas for you to enjoy. 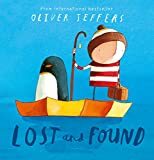 We love the book Lost and Found by Oliver Jeffers, about a boy who finds a lost penguin and tries to help him back to the South Pole. This icy tuff spot works all year round – either in the winter with real snow, or in the summer with ice from the freezer to cool down! 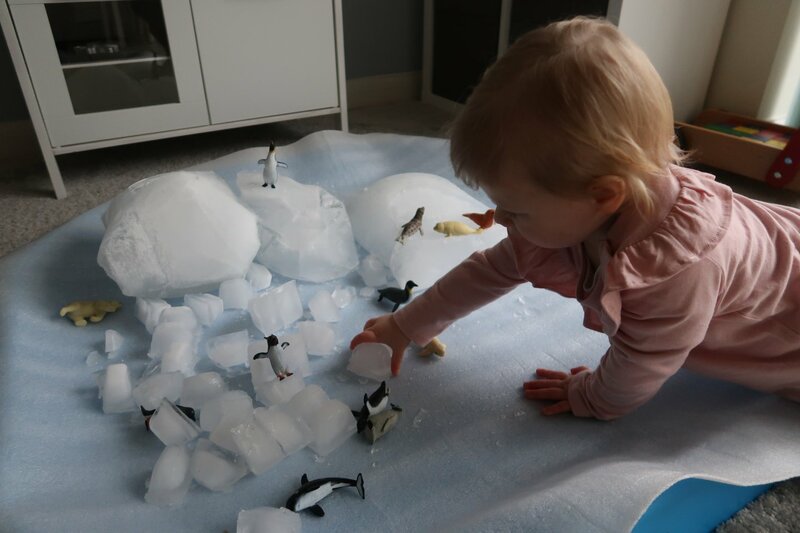 Why not try freezing some polar animals into blocks of ice, and investigate melting? This is a really fun EYFS Elmer activity. 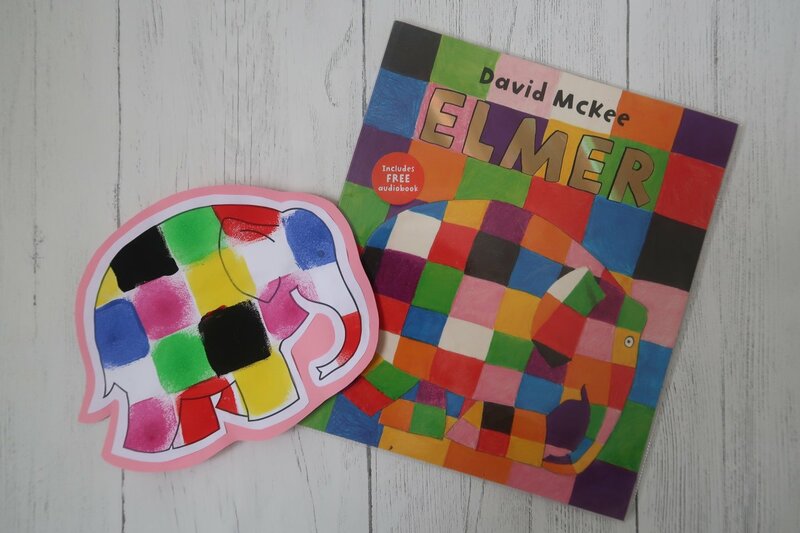 M loves nothing more than getting the paint out, and really enjoyed recreating Elmer using our square sponge stamper and some multicoloured paint. The square sponge made for a good starting point, as M soon began investigating other shapes to stamp with, and found out what happened when different colours mixed together! 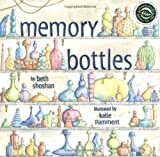 This is one of my favourite picture books in my toddler’s collection. 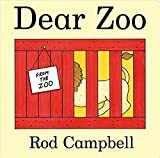 I love the illustrations, the rhyming and the ‘kiss kiss kiss’ at the end, which always earns me a kiss from the toddler! 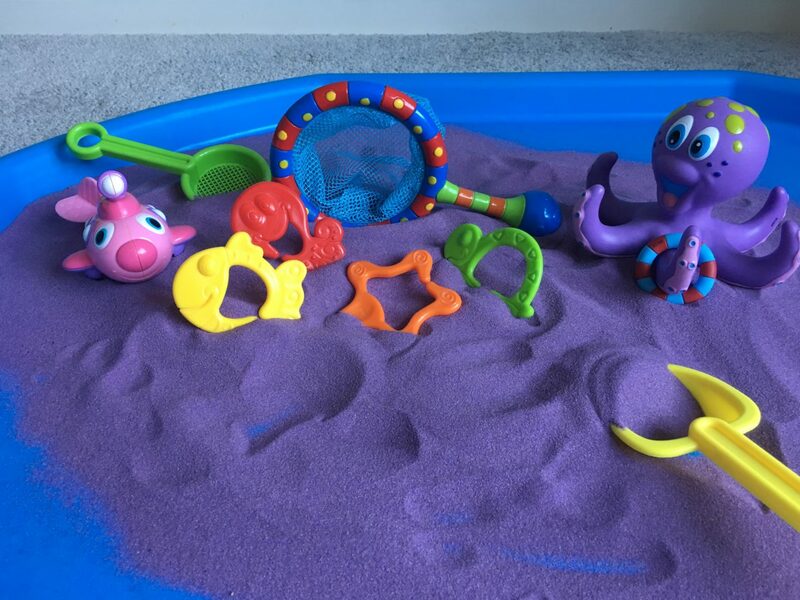 For this activity, we took our bath toys out of the bath and into a tuff spot filled with purple sand. Sand is great for sensory play as it’s brilliant to pour and feel, but you can also encourage to children to mark make in it, which is perfect for the early development of writing. 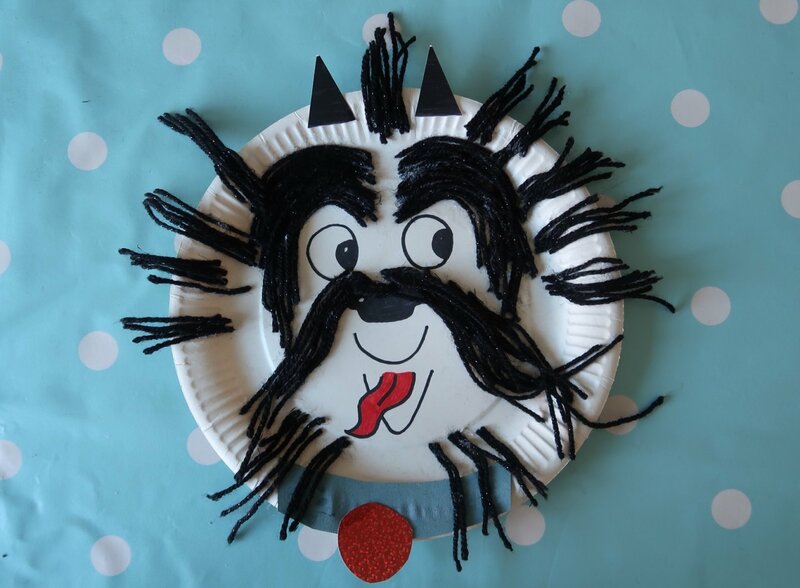 My toddler loved having a go at this Hairy Maclary paper plate craft and insisted that it was just like being on ‘Mister Maker’! It helped her to understand how glue really works and improved her fine motor skills as she began to be more careful with where she placed each strand of wool and where she put the glue. I think this is my favourite of the tuff spot activities I’ve set up for my toddler. Each zone of this zoo themed tuff spot provided her with a different sensory experience to explore and she loved it! From stroking the artificial grass of the giraffe’s enclosure, to pouring and sprinkling the rice and lentils in the other areas. Great fun! M toddler finds water beads fascinating and she loved scooping and swishing them in this pouring activity. Hours of fun; she even climbed in to see how they felt between her toes (cold and squishy, in case you were wondering)! 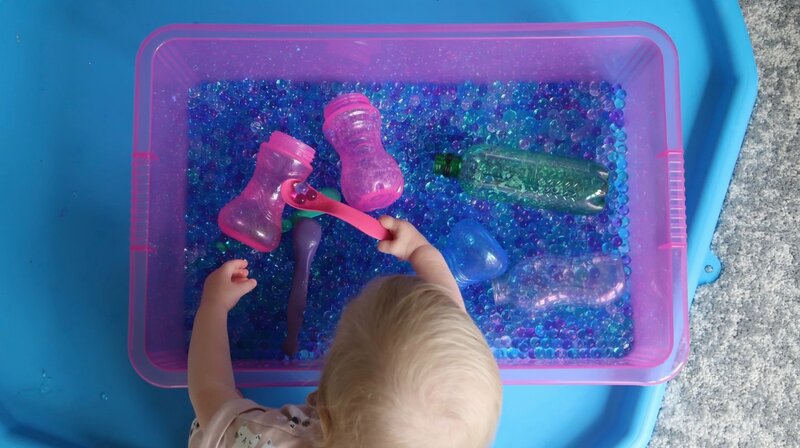 This activity was great for fine motor skills as she spent ages posting the water beads into the tops of the bottles, then squealed with delight as she poured them out! Who doesn’t like dinosaurs?! 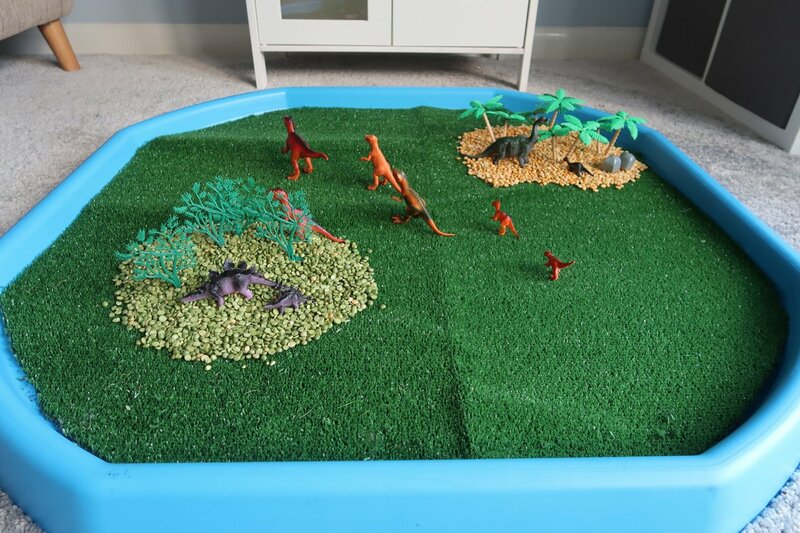 My toddler loved this simple dinosaur tuff spot and it only took a few minutes to set up. The artificial grass for the base cost just £5 (I got it from ebay) and now it’s cut to size, I can create ‘grass’ in the tuff spot, instantly! 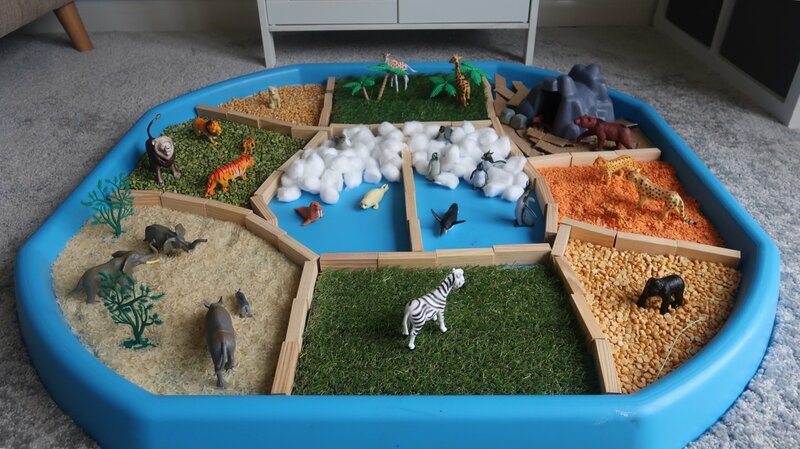 Add a few split peas and lentils to make some dinosaur habitats, and you’re away! This book really makes me chuckle, and it took hardly any time at all to print out some outlines of underpants for the toddler to decorate with stickers. Easy and mess-free, this is a winner of an activity! It helps to develop fine motor skills as peeling the stickers from their backing and positioning them on the underpants is a tricky business for the fingers of little people. 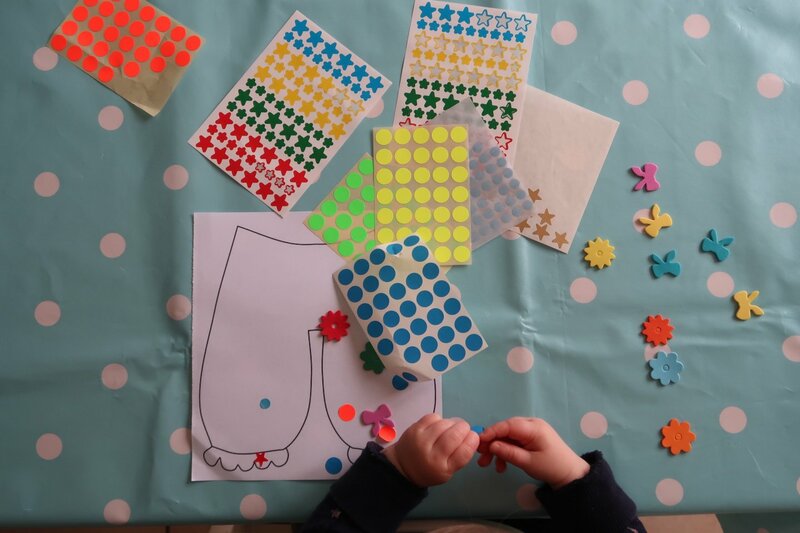 You could also develop recognition of pattern by encouraging your child to make an alternating colour pattern with their stickers. The Very Hungry Caterpillar is a classic, so it had to be included here! 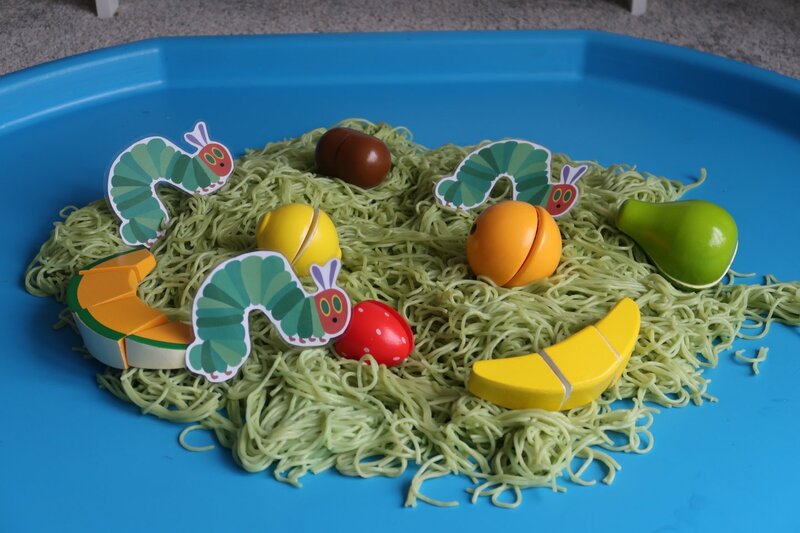 For this Hungry Caterpillar tuff spot activity, I dyed some spaghetti with green food colouring while cooking, then added some wooden fruit and laminated caterpillars. My toddler and I enjoyed retelling the story together while roleplaying with the caterpillars and fruits in the tuff spot. The slimy spaghetti provided a lovely sensory experience! 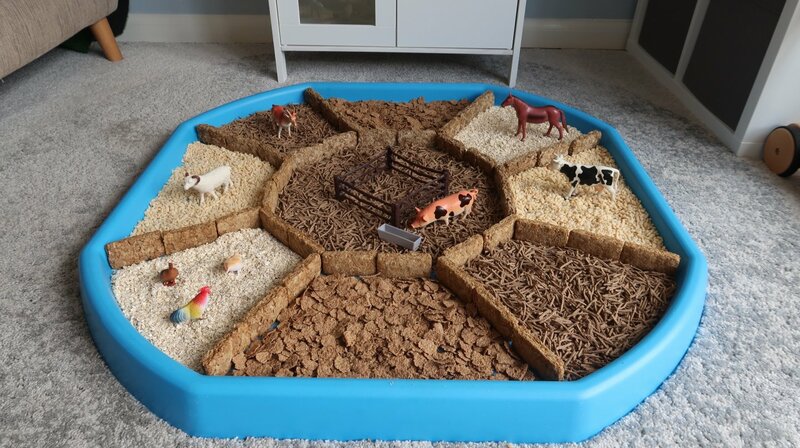 For this sensory farmyard tuff spot linked to A Squash and a Squeeze by Julia Donaldon, I used wheat biscuits as ‘hay bales’ to divide the different zones, then filled each zone with different types of cereal. My toddler loved exploring the different textures, sprinkling the different cereals onto her legs. This was a great activity for broadening her vocabulary, as we talked about whether the cereals felt hard, soft, crunchy or squishy, and the different sounds that the animals make. I hope you enjoy these activities as much as we have! If you enjoyed this post, you can find more Pondering Playtime activities here, and you might like to join my Early Years craft and activity Facebook group; Play Craft, Explore. We’d love to have you! And lastly, don’t forget to Pin it! "Ponderings on Two – Advice from Mrs Magovern"